1. Heat the oil in a casserole pan (or a pan big enough to take the whole chicken) and place the chicken breast side down in the pan and brown, turn the chicken so its golden all over then take out and leave to one side. 2. 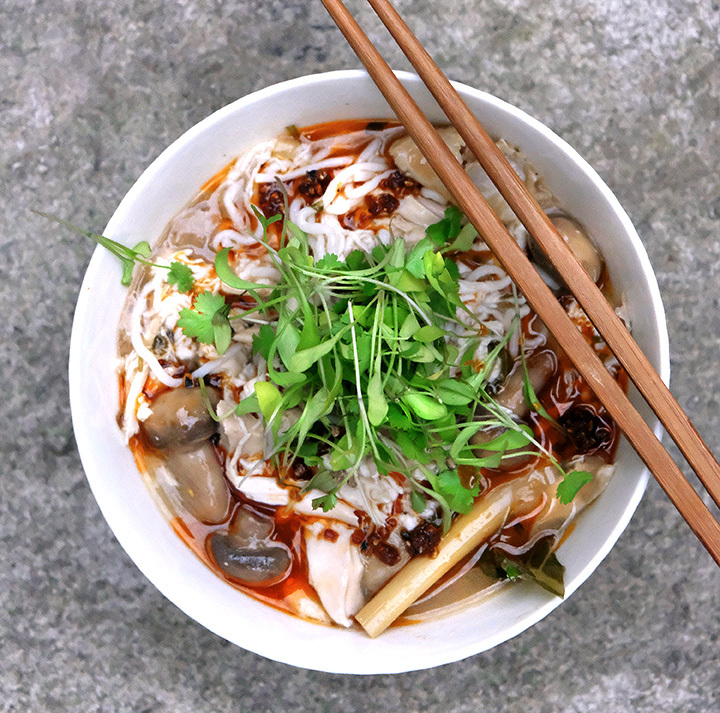 Add the shallots, garlic, lemongrass, coriander stalks, dried chili and mushrooms. Sauté for about 5 minutes till starting to caramelize. Place the chicken back in the pan, pour in the wine and stock. Cover and bring to a simmer. Simmer for about 40 – 45 minutes till the chicken is cooked then take the chicken out, leave to cool slightly and shred. 3. Taste the broth, season and add the honey, soy and lime. Cook the noodles to the instructions on the packet. 4. When ready to serve divide the noodles between warm bowls, add the shredded chicken and pour over the broth. Finish with a good drizzle of chili oil and coriander leaves.